"A fascinating journey of personal growth and empowerment, a series of well-told, memorable stories, intriguing insights into life’s most trying moments, and invaluable guidance when confronted with an unexpected crisis. Highly recommended!" The Columbia Review. “The Lost and Found Collection: The Treasure of Hope” by C.B. Wallis is an inspiring non-fiction work with a strong literary tone and a high spiritual message. Part memoir, part inspirational advice, the book combines deep human insights, rich Christian wisdom, and an authentic voice that shares personal experiences in stories and contemplative memories, poetic and scriptural nuggets, and faith-based witnessing. Much of the book is told in the first person, recounting the author’s experiences that carry relevant messages of overcoming challenges, recovering from calamities, and sustaining hopes for the future. In an eerily appropriate scene, the author recounts the beginning of her spiritual journey as she picked up a new Bible on New Year’s Day and opened it to see the words: “Let there be light!” (Genesis 1:3). Indeed, this book sheds light not only on the author’s eventful life’s journey, but also on life itself and the ways in which the modern world challenges one’s sensibilities and sensitivities. Drawing on her own life’s trials and tribulations, as well as joys and gifts, the author discusses a wide spectrum of subjects of great relevance to all—fears and worries, love and care, generosity and dignity, mental health and physical illness, adoption and family, friendship and enmity, life and death, and even war and peace, as they apply to survivors and veterans. 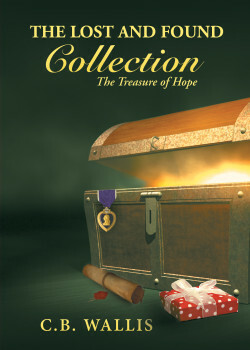 In summary, “The Lost and Found Collection: The Treasure of Hope” by C.B. Wallis is an uplifting, spiritual memoir, sprinkled with gems of wisdom and faith. Readers will enjoy this book and benefit from it on several levels: It is a fascinating journey of personal growth and empowerment, a series of well-told, memorable stories, intriguing insights into life’s most trying moments, and invaluable guidance when confronted with an unexpected crisis. Highly recommended!